This site provides support to teachers in using FASTT Math in the classroom. 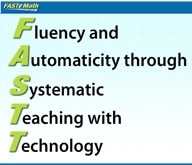 FASTT Math is a researched-based software program for developing math fact fluency. It is a new resource for Waterville Elementary School this school year (2010-2011). The project was was made possible by ARRA funds from the US Dept of Education & Vermont Department of Education. Teacher's Guide (hardcover) and PDF formats (PDF available via the management system). The Fact Fluency Foundations Guide is available to guide instruction for students requiring intensive intervention for prerequisite conceptual skills. in all things we do well." Dr. Ted Hasselbring, author of FASTT MATH, speaks on math fact fluency at the Association of State Supervisors of Mathematics conference in 2009. Dr. Hasselbring is a professor in the Department of Special Education at the Peabody College at Vanderbilt University. Click the link above or the image below. You will be prompted to login in to your Waterville account. Once logged in, you will see the shared files in the Google Docs file manager. NOTE: If you plan to edit the FASST MATH CLASS CHART, please save a copy first!